Michaela Martin-Mason (right) and Stacey Liu rehearse at Walnut Hill School for the Arts. Grace Wang doesn’t recall the age at which she was ushered on stage for her first dance performance, but the 15-year-old from Lexington remembers exactly how the experience made her feel. “I felt something when I looked out at the audience — the power of being on stage, and being able to influence others even though I was so young,” she said. 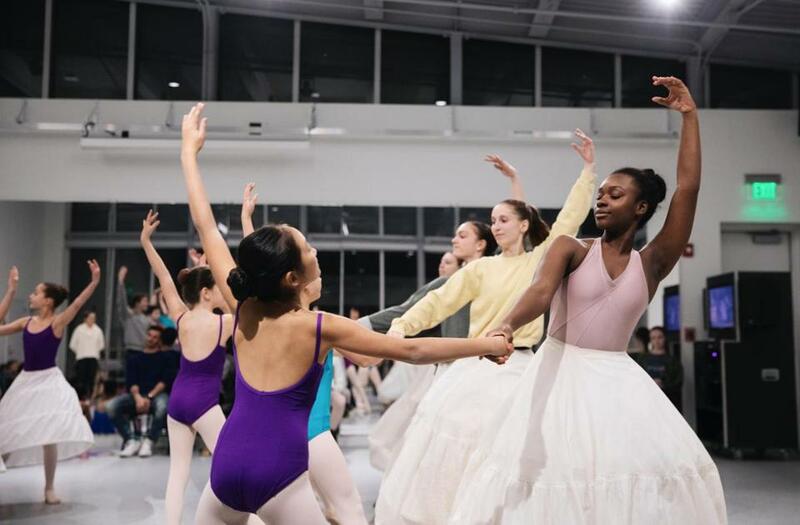 After performing “The Nutcracker” for several years with the Boston Ballet School, Wang looks forward to stepping on stage with Walnut Hill School for the Arts for its Dec. 5-16 production in Natick. Her roles will include the “Waltz of the Flowers,” Columbine, and Spanish dances. The holiday tale, derived from the story written by E.T.A. Hoffmann in 1816 and performed to Pyotr Ilyich Tchaikovsky’s famous score since 1892, is in its 38th year at the independent boarding and day high school. In Walnut Hill’s version, for example, Mother Ginger and her Polichinelles have been replaced with Clara’s puppet theater, represented by all 20 members of the Court of Sweets. The production features students from the school as well as about 100 youths from the Walnut Hill Community Dance Academy. The International Ballet Academy of Norwell, whose eighth season opens in Winchester on Sunday, Dec. 2, and continues in Scituate on Dec. 8 and 9, incorporates a Scottish jig this year in honor of an 83-year-old performer who was a Highland dance champion in her youth. The youngest cast member among 50 professional, freelance, and student dancers from its Norwell and Burlington studios is 7 years old, according to Melinda Marculetiu, the academy’s co-founder and co-artistic director. Collectively, they perform more than 60 roles requiring upwards of 130 costumes and an untold number of props — including wooden guns for the toy soldiers, English horns for the party scene, and exquisite umbrellas from China for added authenticity in the Chinese Tea dance. In fact, audiences are so loyal that Marculetiu has taken to personally calling a dedicated but not computer-savvy group of past attendees when tickets go on sale. “They love us, and they love following the growth and enormous improvement of our dancers, which is beautiful to see,” said the Quincy resident, noting that a different Clara is featured in all four performances because of the strength and quality of the dancers who have rehearsed seven days a week since September. For Dance Prism, a touring ballet company in its 36th season, the show must go on — even during blizzards — with 150 professionals, pre-professionals, student dancers, and regional casts. Performances are scheduled in Sudbury, Littleton, and Andover. “Somebody once did a rapid motion film of our stage setup, and it was quite magical,” said artistic director and cofounder Mary Demaso, who lives in Lexington. Because each performance center has its own technical and logistic challenges, she credits the show’s success to the professionalism, work ethic, and close relationships of her dancers. Caitlin Klinger, a 30-year-old dancer who has performed progressively advanced roles in Dance Prism’s “Nutcracker” since she was a child, is a Sugar Plum Fairy and Dew Drop Fairy this year. She also has been in the party scene alongside her parents, Jeff and Katherine of Sudbury, as well as their family dog, Zoe. Jonathan Towle, 58, of Hudson, is a charter member of Dance Prism who began taking ballet lessons with Demaso at age 17 and has danced every male role except the Nutcracker Prince. He agrees that the family atmosphere inspires loyalty. In 36 years, he missed just one weekend of performing Dr. Drosselmeyer — when his appendix was removed in 2011. After tiring of being a “dance widow,” Towle’s wife, Christine, has also danced multiple roles, including Fritz when the company lacked a male of appropriate age and ability. Their daughter, Sadie, has been a Mini Doll and Page in the Kingdom of Sweets while their son, Danny, has grown from a Party Boy into a Party Parent. “I always wanted my children to follow their own path, but it’s nice this has been something we’ve been able to do together,” said Towle, noting that other families have made a tradition of attending the annual meet-and-greet events. 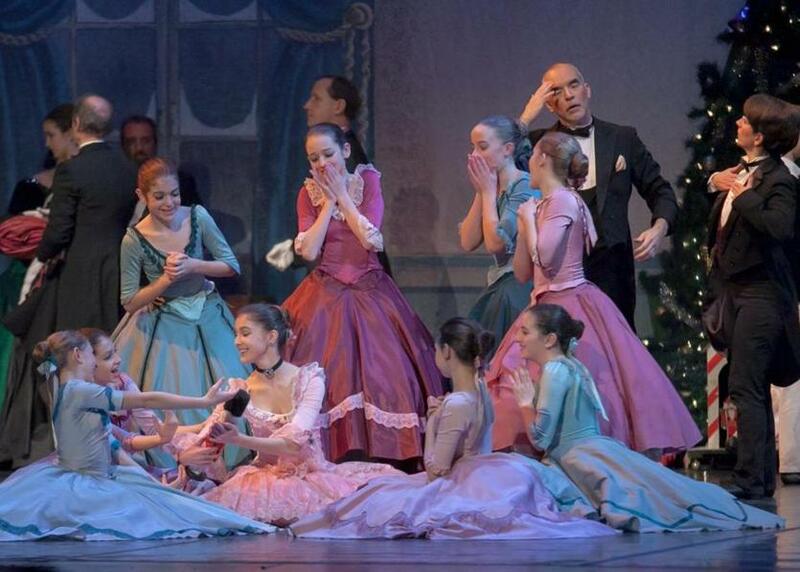 Dance Prism dancers admire the Nutcracker given to Clara (Zoe Tatarka of Westford). Young audience members are invited to meet Clara and the Nutcracker Prince following all performances. Dec. 5-7, 7 p.m.; Dec. 8, 2 and 7 p.m.; Dec. 9, 2 p.m.; Dec. 13-15, 7 p.m.; Dec. 16, 2 p.m.
Cindy Cantrell can be reached at cindycantrell20@gmail.com.